School Farm Cottages01986 798844work Self-cateringOur 4 cottages offer a peaceful retreat in an attractive village setting. These well-equipped cottages overlook beautiful rolling countryside, and are an ideal base to explore the Suffolk's sunrise coast, Norfolk Broads, Suffolk's market towns including Framlingham - with its castle. Ideal for couples, families or groups, facilities include a large, secure garden with climbing frame, football pitch, fishing, games room with pool table and table tennis, conference facilities, cycle hire, pet's corner and countryside walks. Two of our cottages are wheelchair friendly, all have free Wi-Fi and prices include heating, electricity and bed linen. 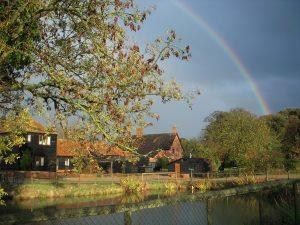 Our 4 cottages offer a peaceful retreat in an attractive village setting. These well-equipped cottages overlook beautiful rolling countryside, and are an ideal base to explore the Suffolk's sunrise coast, Norfolk Broads, Suffolk's market towns including Framlingham - with its castle. We are delighted to have just been awarded the Suffolk Carbon Charter Gold Award in recognition of the steps that we have taken to reduce the carbon emissions we create, and our care for the environment. All heating is provided by a wood chip boiler using locally sourced virgin wood chip, we have installed solar panels to generate electricity, manage our farmland to benefit wildlife and the environment, and have lots to do if you would like to enjoy car free days. Cycle storage available. Golf course 6 miles away; 15 miles from Southwold on the Heritage Coast. Children welcome from any age. From A12 take B1116 through Framlingham to Laxfield. In centre of Laxfield turn off beside Royal Oak and go to centre of Cratfield village. We are on jct of Church Road and The Street. From Halesworth - 6 miles Railway station - taxi.